For a long time I have been a proponent of backing up your personal data to an online location. I know many people will backup data to external hard drives…but that has always caused me concern because of the possibility of losing both the original and the backup in a fire/theft/natural disaster. Over the years I have gone through a number of different backup options and have switched for various reasons. I am in the process of switching again (the initial upload is currently taking place). For a while I was using Mozy.com because it was simple and reasonably cheap ($6/month). About a year or so ago I switched to CrashPlan from Code42.com…mainly because they were significantly cheaper. Both of these products are very easy to use and easily configurable. My problem with them…and especially with CrashPlan is that it is a memory hog. Mozy is arguably not terrible…but it was still using approximately 70MB or RAM on my wife’s computer..while it was sitting idle. CrashPlan was a LOT worse…it was using between 250-300MB of RAM while doing absolutely nothing. That is simply unacceptable…which got me re-evaluating options again. First…sign up for a Microsoft account at Outlook.com. This will get you both an email address (that you can choose to either use or not) as well as access to your free space. From there you can “Manage Storage” to add additional space. From the SkyDrive site, look in the bottom left corner and click “Get SkyDrive apps” which will take you to a page to install the Windows Desktop app. (Note that they also have apps for Windows Phone, iPhone/iPad and Android.) When installing the app, it will ask for the location to save SkyDrive files into (the default is c:\users\username\SkyDrive). Instead of accepting the default option, I chose to have it use D:\SkyDrive. I then changed all of my “special folders” (My Docs, My Pics, My Music, Favorites) to point to D:\SkyDrive\Documents, D:\SkyDrive\Favorites, etc. Now…I just save as normal to Docs/Pics/Favorites…and they are automatically uploaded to SkyDrive. Nothing to think about…nothing to configure. To change the location of the special folders, open up the c:\users\username folder, then right click one of the special folders (like “My Music”). Flip to the “Location” tab and select “Move…”. Choose the “d:\SkyDrive\Music” folder (change to reflect where you put the SkyDrive folder). Allow Windows to move the data to the new folder. This could take a while, so be patient and let it continue. Limited storage if you have more than 100GB of data to back up. I would expect them to expand this later, but right now…you have a max of 107GB (125 if you signed up in time). Very low footprint…even in the height of backup up 50+GB of data, the RAM used by SkyDrive on my wife’s computer was at most 34MB…it was commonly below 30MB. You have full access to the data from you computer as well as your mobile device (Windows Phone, iPhone/iPad, Android). You can also configure the SkyDrive app to allow you access to the rest of your computer. BTW…I did take a screenshot of the RAM usage while both CrashPlan and SkyDrive were running. 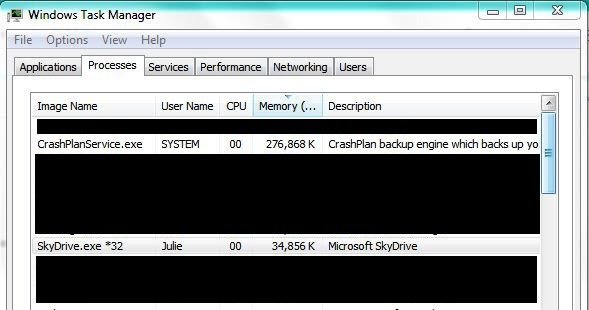 Any wonder why I didn’t want to continue using CrashPlan? 200-300MB is an issue nowadays? RAM is cheap! I have 1.5TB backed up with CrashPlan, for very very cheap. You can also backup to an external drive and even to someone else’s computer (both free options if you don’t want to do online). A little bit of RAM usage is a very small price to pay for that kind of benefit. While I agree it is a bit of a ram hog, one of the invaluable features with the free edition is the ability to sync folders across the wan to another location. IE a relatives house across the state/country. Then backups for them are at your house (roughly off-setting the extra electricity costs). This to me makes it worth it when looking at TB’s of data.